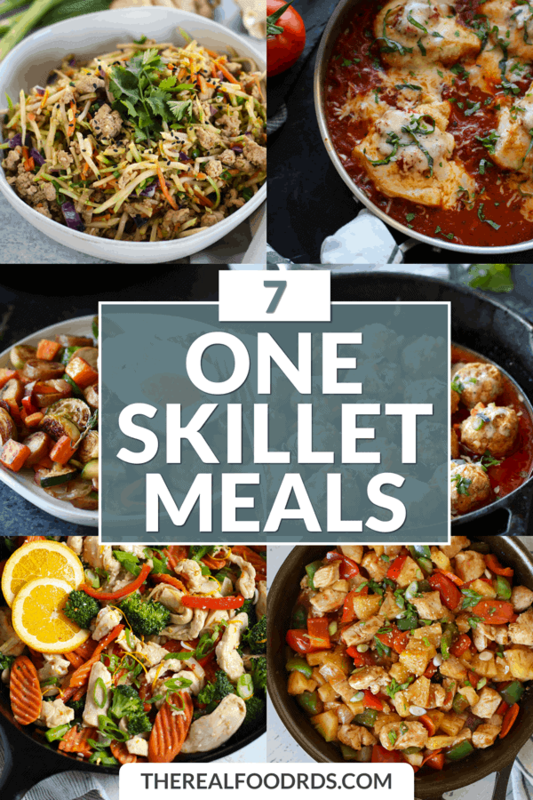 Speed up the cooking and clean-up process by whipping up one of these 7 One-Skillet Meals so you can get in and out of the kitchen fast! Given our profession, it’s a bit of given that we enjoy cooking and baking, however you will never hear us discussing the joy that comes from prepping, washing and cleaning up after our somewhat continuous recipe testing. A dish here and there, sure, we’ve got that. But when there are piles of dishes from one end of the kitchen to another…well, that’s another story. Sure, it’s satisfying when we finally have a clean kitchen again, but dang, it uses up a lot of time and energy! That’s why, as much as possible, we strive to create recipes that use minimal kitchen equipment and ingredients. 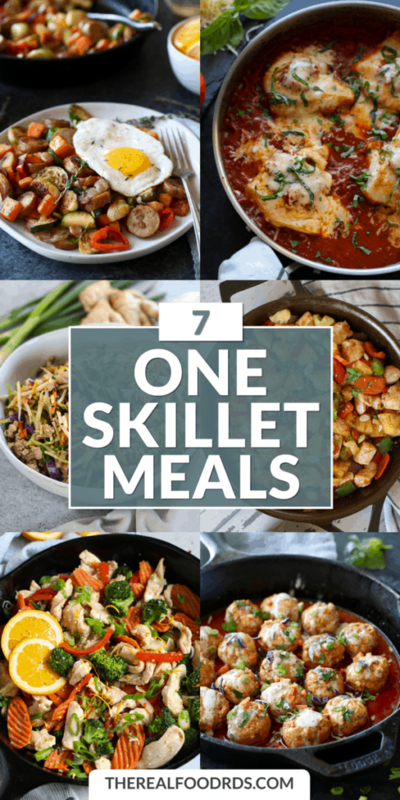 And if it all fits in one pan/skillet – we do a little happy dance. Trust us, the moves are incredible. It’s amazing what can all fit into one pan – especially if it’s got a lid. Here’s the tricky part though – not all skillets and pans are created alike. We prefer one that has a lot of room (deep enough and big enough around to accommodate loads of ingredients), is easy to clean and of course, that can seamlessly go from stovetop to oven cooking. 10-inch pre-seasoned cast iron skillet the silicone handle – This skillet is great for those who are cooking for 1-2 people or when you want to make a smaller amount of food. Since it’s smaller, it’s also lighter. The silicone “handle” is actually a silicone cover that you can slip onto the cast iron handle for easier handling (however, you want to avoid cooking with it in place as it will get hot). As with all cast iron cookware, you can use any type of cooking utensil as the surface won’t scratch so feel free to use a fork or a metal spatula. 12-inch pre-seasoned cast iron with tempered glass lid – The 12-inch cast iron skillet is our go-to for one skillet meals and any time we want to cook up big batches of vegetables (think fajitas, greens, home-fried potatoes, hash browns etc.) or sear chicken or meat without overcrowding the pan. This particular pan comes with a tempered glass lid which is handy if you don’t have a stock pile of lids from your other cookware that will fit a 12-inch skillet. 15-inch pre-seasoned cast iron skillet – This one is the family meal enthusiast. It’s big, but it’s also great for making French toast and pancakes without having to do just one or two at a time. Pre-seasoned cast iron 3-skillet bundle (12″, 10.25″, 8″) – This is the perfect “starter kit” for those looking to get cooking with cast iron because it offers a variety of sizes. The 12-inch skillet is great for big meals or loads of veggies, the 10.25-inch is good for smaller jobs or when you want to use it on the grill (yes, you can use cast iron your grill) and the 8-inch is our favorite for making egg bakes, frittatas, quiches, coffee cakes, cornbread and more. Anything you can bake in an 8″x 8″ baking dish you can do in an 8-inch cast iron skillet. 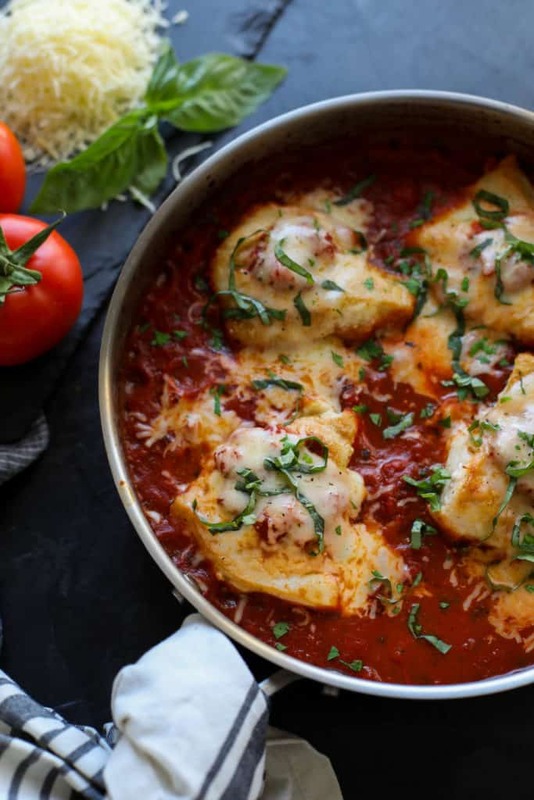 Lodge Enameled 11-inch cast iron skillet – We love enameled cast iron for its durability, natural non-stick quality and the fact that it won’t rust or leach (standard cast iron skillets will leach small, though harmless, amounts of iron into your food when cooking acidic foods such as our One-Skillet Chicken Parmesan below). They’re also easier to care for as you don’t have to dry then apply a thin layer of cooking oil to the surface after each use. And they’re also lovely to look at so keep that in mind if you want to keep your skillet on the stovetop so it’s always handy. Bamboo, wooden or silicone cooking utensils are recommended for use in this type of skillet to prevent scratching away the enamel surface. LeCrueset Enameled 11¾-inch cast iron skillet – The same benefits of the above enameled cast iron skillet can be found in this more upscale version from LeCrueset. We both own skillets from each brand and use them regularly. The only benefit we’ve found thus far with this brand is the remarkable number of gorgeous colors and sizes available and have found that the enameled surface is a bit more durable. This piece is truly heirloom quality so don’t be surprised if your kids start talking about who will get it once you’re done with it. All-Clad Stainless 12-inch skillet with lid – Though not cast iron, we’ve found that this stainless steel skillet with a lid works perfectly for stovetop-to-oven cooking and it’s dishwasher safe for those who prefer not to scrub pots and pans by hand. The only caveat here is that stainless steel cookware is not non-stick so you’ll need a bit more oil than your recipe calls for to keep foods from sticking to the surface of the pan. 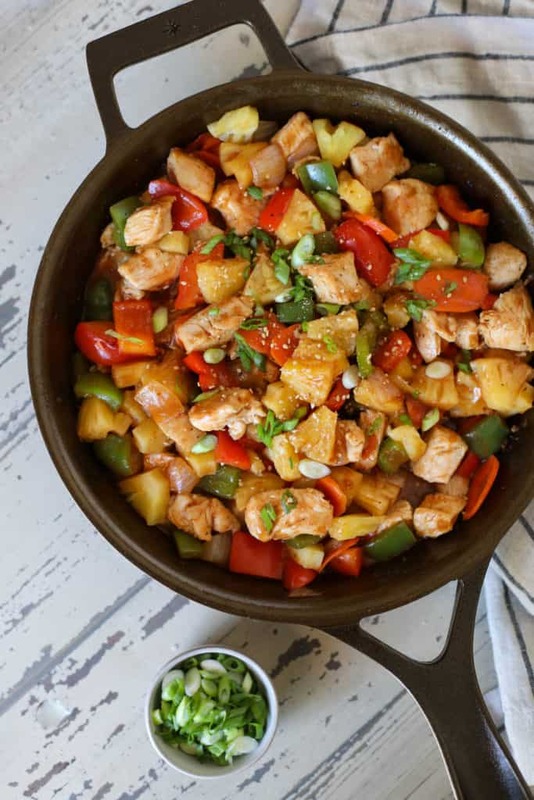 Skip the takeout and whip up this skillet with the fam tonight! Make it extra hearty by serving with cauli-rice or brown rice if you wish. The perfect solution when you’ve got an Italian comfort food craving without all the fuss. It’s saucy, cheesy and pairs wonderfully with or without your favorite gluten-free pasta or zoodles! 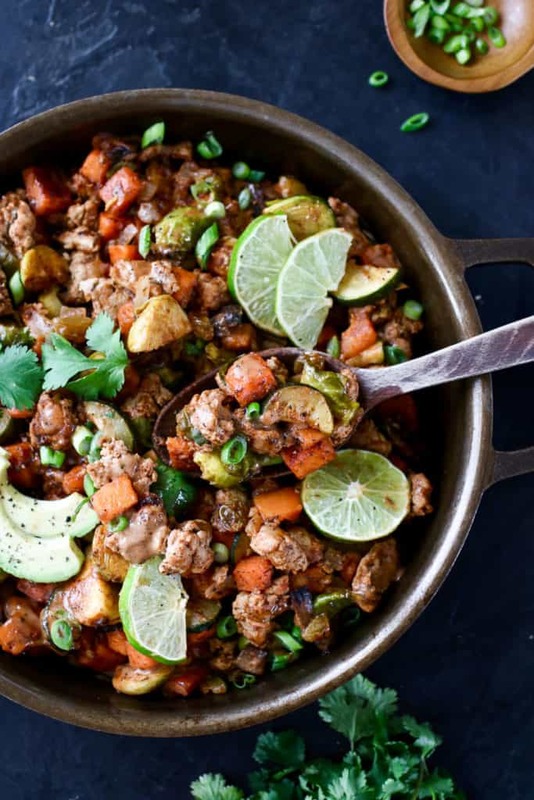 Sausage, bacon, sweet potatoes and Brussels sprouts… this skillet has it all. It’s hearty enough to eat on its own but tastes even better topped with a fried egg or two. 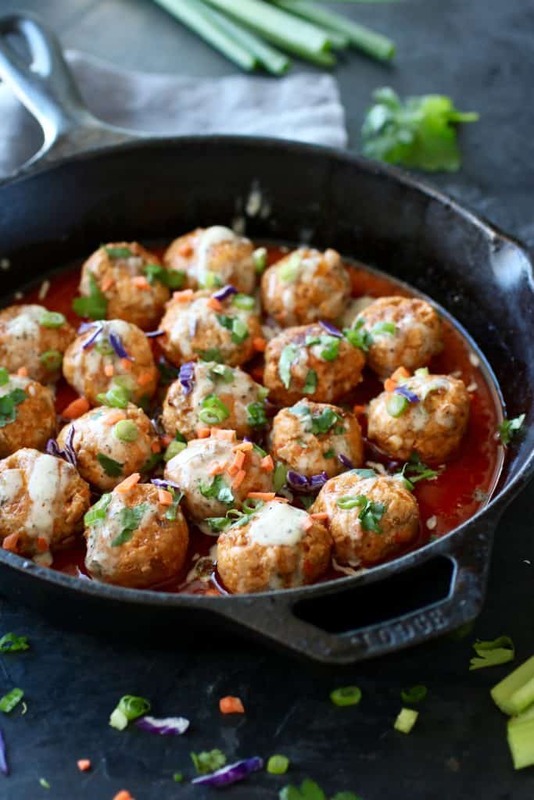 Perfect for a last-minute dinner or party appetizer, these tasty balls of goodness are also loaded with veggies, but no one will ever know! 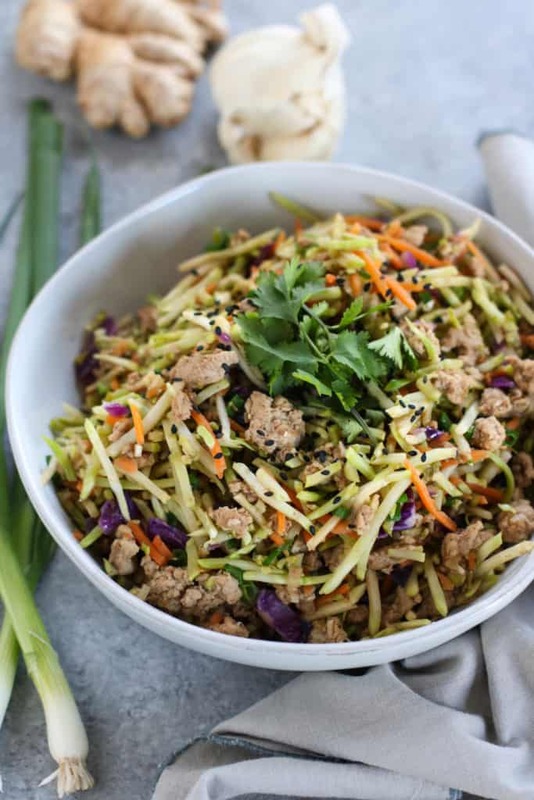 One of our most popular recipes, this one-dish marvel is chock full of veggies, made in less than 30 minutes and makes for a wonderful meal prep recipe – the leftovers are that good! 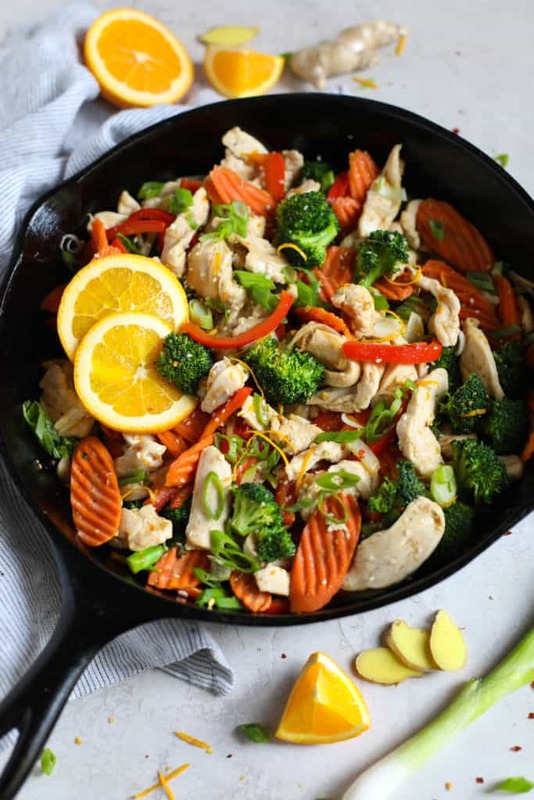 This quick and easy stir fry is so easy to adapt to what you’ve got on hand and what your family likes – and when you do the chopping ahead of time, you’re just 15 minutes away from a delicious and satisfying meal. 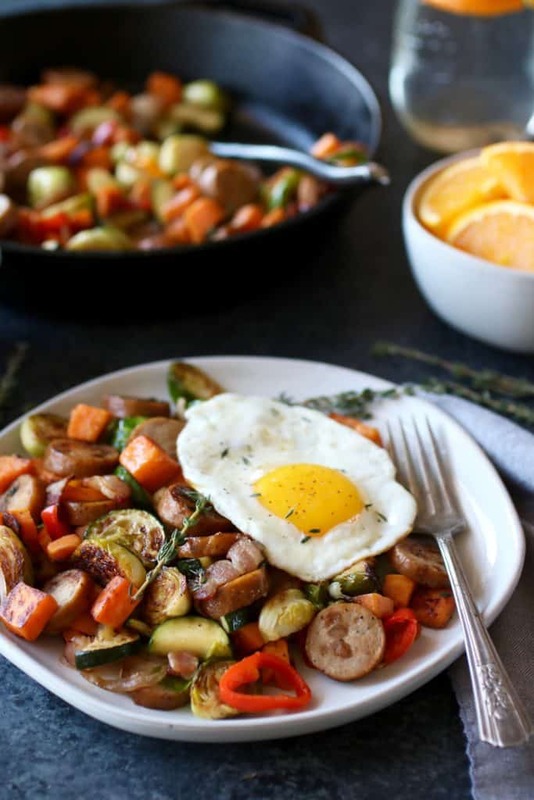 Healthy, wholesome and veggie-packed, this one-skillet dish is packed full of flavor and on your dinner table in 30 minutes or less and sure to kick you out of any dinner rut in a hurry. Don’t forget to pin these recipes for later!